Home > The Spann-Fischer Codependency Scale (SF CDS). Outcomes measurement tool: relationships – co-dependency. 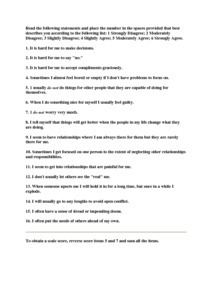 Fischer, JL and Spann, L and Crawford, D (1991) The Spann-Fischer Codependency Scale (SF CDS). Outcomes measurement tool: relationships – co-dependency. This scale measures co-dependency, defined as "a dysfunctional pattern of relating to others with an extreme focus outside of oneself, lack of expression of feelings, and personal meaning derived from relationships with others". The scale is not specific to drugs and alcohol but highlights co-dependent personality traits.